Figure 3.2 (Revised). 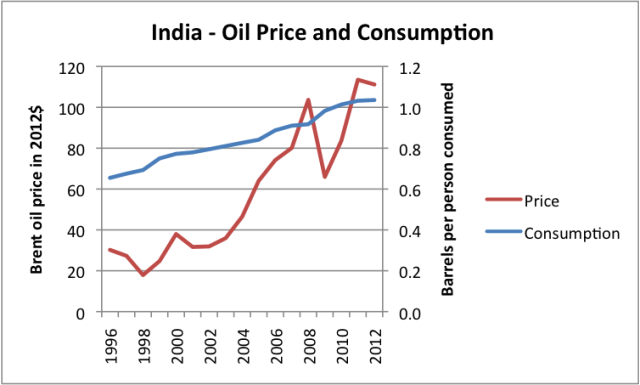 Liquids (including biofuel, etc) consumption for India, based on data of US EIA, together with Brent oil price in 2012 dollars, based on BP Statistical Review of World Energy updated with EIA data. 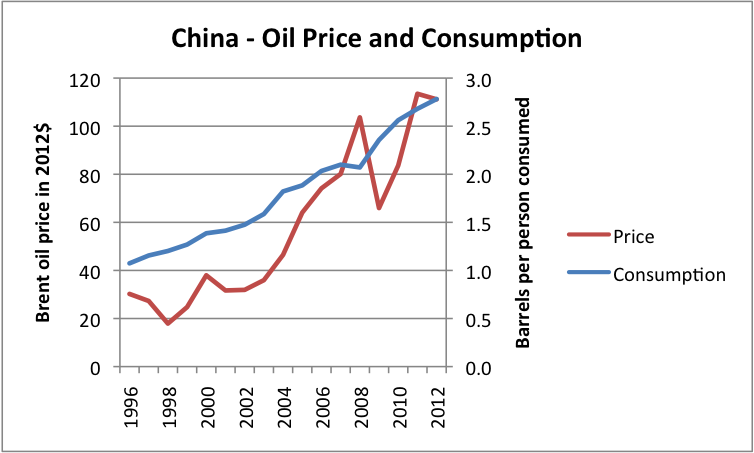 From both figures shown above, oil price has increased particularly China. China went from around $40 to $110 whereas India went from $65 to $105. One thing to note is that oil price has risen very steadily with no notable drops in price. 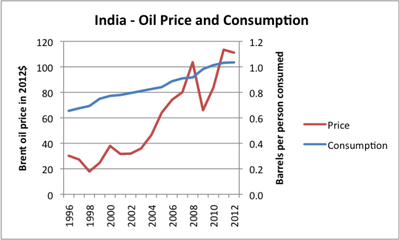 On the other hand, we can see that at the $100-$110 per barrel price mark, there appears to be a flattening in per capita consumption, especially India. 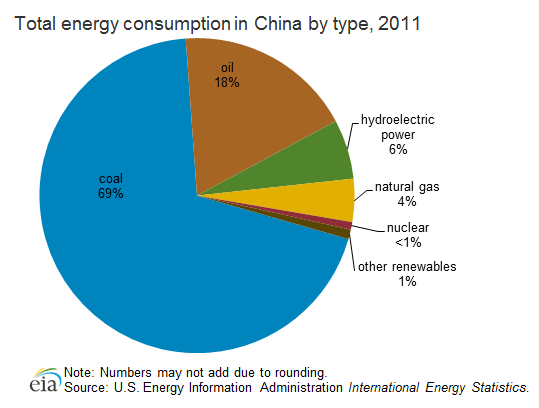 Coal served as a vast majority (69%) of China's total energy consumption in 2011. 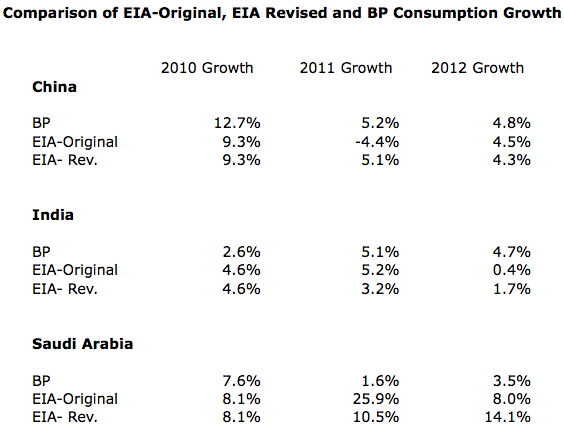 Oil was the second largest source, taking up 18% of China's total energy consumption. The other sources show signs of China's efforts to diversify into other energy source such as hydroelectric sources (6%), natural gas (4%), nuclear power (less than 1%), and other renewables (1%). 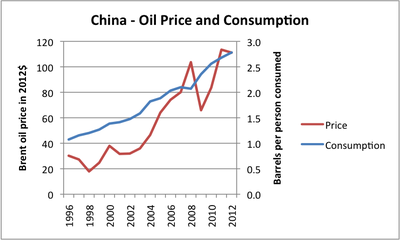 However, this only adds up to 12% of China's total energy consumption which is a relatively small share. Theoretically speaking, China is around 4 times as reliant on coal than oil or other energy sources. This high coal consumption percentage is the exact reason for China being the world's leading energy-related Carbon Dioxide emitter. In 2011, China emitted 8,7715 million metric tons of carbon dioxide.